The Nation: Paul Ryan's Focus On Dignity Paul Ryan, R-Wis, has released the Republican house budget proposal. Greg Kaufmann of The Nation argues that Paul Ryan's budget will devastate many social programs that Americans rely on. 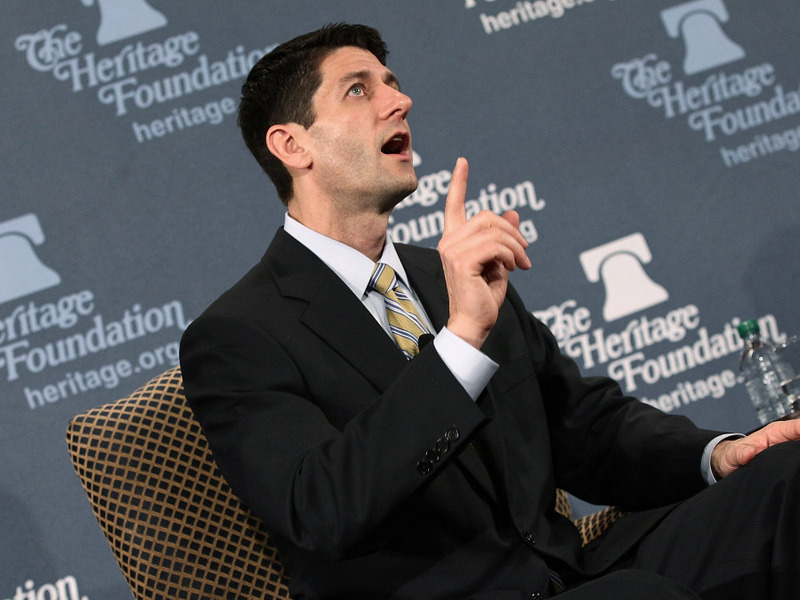 House Budget Chairman U.S. Rep. Paul Ryan, R-Wis, speaks at the Heritage Foundation March 22, 2012 in Washington, DC. During his remarks, Ryan spoke about the fiscal year 2013 federal budget proposal that he unveiled earlier in the week. Greg Kaufmann is a Nation contributor. "Promoting the natural rights and the inherent dignity of the individual must be the central focus of all government." That's what Congressman Paul Ryan wrote earlier this month in an exclusive commentary for Spotlight on Poverty and Opportunity. This week, he revealed exactly where his laser-like focus on dignity would lead this nation. He released his budget proposal, as clear a statement of one's principles and priorities as there is in politics. Here are the results, and they're not pretty. Nation readers with young children should probably ask them to leave the room before reading onward. Mr. Ryan's focus on dignity... means a cut in food stamps of $133 billion over ten years, even though 76 percent of participating households include a child, senior or disabled person, nearly half of all recipients are children and 40 percent of single mothers use food stamps to help feed their families. A $13.4 billion cut in one year translates to as many as 8.2 billion meals lost for low-income people, more kids at risk of being underweight or developmentally delayed, worse educational outcomes and more stressed-out parents. The congressman would also block-grant the program so it would no longer be able to respond to rising need during times like these — in 2010 alone food stamps kept 3.9 million people out of poverty. If you liked thecash assistance for poor families (TANF) block grant — which resulted in a free-fall from 68 of every 100 poor families receiving help to 27 of every 100 — then you will absolutely love the Don't Worry Ryan Will Feed You block grant. Mr. Ryan's focus on dignity... means the repeal of the Affordable Care Act and attacking Medicaid with his block-granting light saber. The repeal results in at least 33 million people losing their healthcare, and the Don't Worry Ryan Will Heal You block grant shifts costs of covering poor people to the states (because their budgets are in such great shape) — cutting federal funding by approximately 20 percent over the next decade and adding "tens of millions of Americans to the ranks of the uninsured and underinsured," according the Center on Budget and Policy Priorities (CBPP). Worth noting too is that two out of every three Medicaid dollars currently goes to care for people in nursing homes, victims of catastrophic accidents and disabled children, according to the Center for American Progress. Mr. Ryan's focus on dignity... means reneging on the already austere discretionary spending level just passed by Congress during the deficit ceiling debacle so that the Congressman can lower it by another $19 billion. He would further squeeze spending on programs such as WIC, Head Start, affordable housing, heating and cooling assistance, childcare assistance, education, public health. Defense, however, would receive $203 billion more than the Pentagon itself is asking for over the next decade (at the expense of cuts to programs that veterans disproportionately rely on). "Non-defense discretionary spending is already on a path to be at the lowest level it's been since the Eisenhower administration and the House GOP budget is talking about cutting it by an additional 25 percent," said Melissa Boteach, director of Half in Ten, a campaign to reduce poverty by 50 percent over ten years. Mr. Ryan's focus on dignity... means knowing the poor and vulnerable will be hit and hit hard, but not being entirely sure how and where. Jim Horney, vice president for federal fiscal policy at CBPP, says the congressman's $1.2 trillion in unspecified cuts to "non-health mandatory" programs amount to a "massive hidden" cut to the safety net. "You cannot achieve those savings without making very deep cuts in the crucial safety-net programs in this category, such as... Supplemental Security Income for the elderly and disabled poor, Temporary Assistance for Needy Families (TANF), the school lunch and other child nutrition programs, and unemployment insurance," writes Horney. Mr. Ryan's focus on dignity... means not only extending the Bush tax cuts for the wealthy but handing them an additional $3 trillion in tax cuts to boot. If he just extended the Bush tax cuts, but nixed the Don't Worry Rich People, Ryan Loves You additional tax cuts — that alone would pay for the repeal of the Affordable Care Act, the Medicaid cuts, the SNAP cuts and domestic discretionary spending cuts. "The inherent dignity of all people is the foundational principle of Catholic social teaching because we're all created in the image of God," Father Thomas Kelly, a constituent of Representative Ryan's, told me after a conference call with Half in Ten. "A budget that cuts nutrition programs for poor children and tells working families they must sacrifice even more so the wealthy can have bigger tax cuts offends bedrock Catholic values. It's hard to square Representative Ryan's moral rhetoric with the cruel reality of this budget." "A budget that diminishes what we provide for the one in six Americans who are struggling with hunger is not a budget befitting a moral country," said Rabbi Steve Gutow, president of the Jewish Council for Public Affairs. "A plan reflective of our national priorities should seek to lift up our neighbors in a time of high unemployment and poverty; instead, this demands the most from those with the least, and flies in the face of the common dignity of all Americans." Mr. Ryan's focus on dignity... means that the man is in desperate need of LASIK surgery. Better hurry, before he's forced to rely on his proposed Don't Worry Ryan Will Give You A Voucher healthcare system for seniors.